The condition and operation of the front fork must be checked as follows at the intervals specified in the periodic maintenance and lubrication chart. Check the inner tubes for scratches, damage and excessive oil leakage. Place the vehicle on a level surface and hold it in an upright position. WARNING! To avoid injury, securely support the vehicle so there is no danger of it falling over. 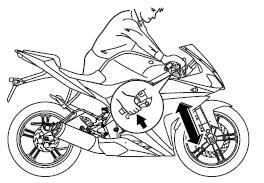 While applying the front brake, push down hard on the handlebars several times to check if the front fork compresses and rebounds smoothly. If any damage is found or the front fork does not operate smoothly, have a Yamaha dealer check or repair it.